Pdf’s of all papers referred to can be found under publications. 19 February 2019 Funding success: Congratulations to Yannick and Sahira for winning grants from the Holsworth Wildlife Research Endowment for their research. 5 February 2019 Media: Sahira speaks about the Great Southern Reef in interviews for the Sunday Times and PerthNow: Environmentalists, oil firms set to go to war over Great Southern Reef. 11 January 2019 Conference attendance: Albert, Yannick, Salvador, Heather, Sahira and Thomas attended the 12th International Temperate Reefs Symposium (ITRS) in Hong Kong, where we also got to catch up with ARC DECRA fellow Karen, who will be joining the lab later in the year. An amazing week of cathcing up with old friends and colleagues, temperate reefs science and Asian cuisine – ITRS rocks! 27 November 2018 Funding success: Proud to have been funded by the Australian Research Council (ARC) to work with Melinda Coleman and Karen Filbee-Dexter on the Discovery Project (DP19) ‘Turf Wars: fighting the new battle facing blue forests‘. Also, very pleased that Karen was awarded a DECRA (DE19) ‘Regime shifts from kelp forests to turfs: drivers, resilience and future‘ to join the Wernberg lab and increase our quest to understand kelp to turf transitions globally. 19 November 2018 Funding success: Congratulations to Sahira and Nestor on both winning grants from the Sea World Research and Rescue Foundation Inc., for their projects ‘Reef fish functional diversity changes along an ocean warming hotspot’ and ‘Living at the cold edge: can tropical fish species maintain their functionality within tropicalized temperate reefs?’. 23 October 2018 Media: Part of our oceans are dying. Invited opinion article in The World Post (The Washington Post & Berggruen Institute) where Thomas and Karen raise awareness of the perils of kelp forests in warming oceans. Translated to Norwegian and reprinted on Forskning.no. 8 October 2018 Media: Thomas talks to the New York Times about the Great Southern Reef and the threats of climate change. Read the article here: There’s more than one: Australia’s other great (and threatened) coral reefs. 2 August 2018 Presentation: Thomas gives invited plenary on Flattening of global kelp forests: tales of turf, temperature and tropical herbivores at the joint PSA/ISOP meeting in Vancouver, Canada. the past century on global trends in marine heatwaves has been published in Nature Communications. Read the press release here: Increasing marine heatwaves threaten our oceans. 18 January 2018 Press release: Our paper Rise of Turfs: A New Battlefront for Globally Declining Kelp Forests has been published in BioScience. Read the press release here: The rise of turfs – flattening of global kelp forests. 14 December 2017 Impact: Our Science paper on the consequences range-shifting species listed as one of the 2017 top 30 global sustainability research papers2017 top 30 global sustainability research papers according to Altimetric. 13 November 2017 Media: Who’s heard of the Great Southern Reef? and Kelp needs our help. Australian Academy of Science. 2 November 2017 Communication: A cry for kelp. SciCom student Alice Redgate has produced a youtube video about our kelp research. 1 November 2017 Media: The Great Southern Reef: article in The Monthly written by James Bradley. 22 August 2017 Media: Vanishing kelp: Warm ocean takes toll on undersea forests. Thomas talks to Michael Casey from Associated Press about Dijkstra et al.’s paper on invasive turf algae and kelp loss in the Gulf of Maine. Re-published on New York Times, USNews, Japan Today, NTNews, VOANews, Calgary Herald. 22 May 2017 Funding success: Congratulations to Sahira who won a grant from The Holsworth Wildlife Research Endowment for the project ‘Global threats to ocean forests: disentangling the impacts of heatwaves and herbivores’ as part of her PhD research. 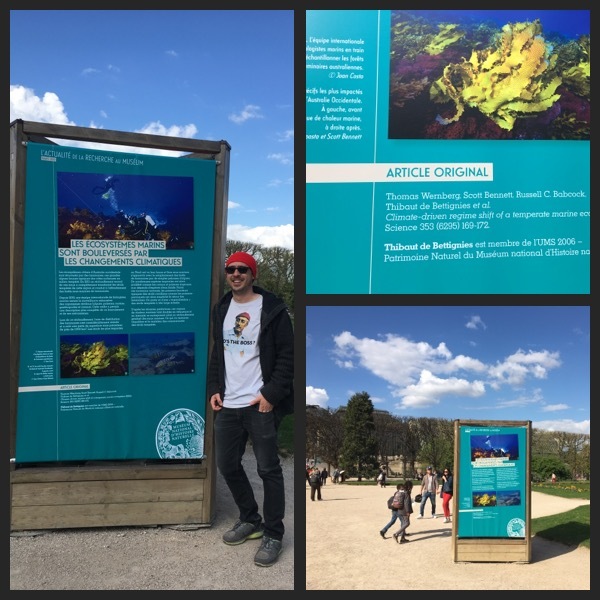 3 April 2017 Communication: Thibaut spreading the word in France, on threats to kelp forests from climate change. Tib’s poster is sporting key findings from our Science paper showing extensive loss of kelp forests in WA following the 2011 marine heatwave. The poster is on display in front of the Museum of Natural History in Paris, where it is part of a long-term exhibition by the Museum. Well done Tib for flying the colours of the lab (and the boss! nice t-shirt!). 31 March 2017 Publication: Just out and co-authored by Thomas, a major review in Science documenting the pervasive effects across biological, environmental and human systems of range-shifting species. As rightfully deserved, the paper received very broad national and international media attention. Here is an example from The Guardian. 23 March 2017 Expedition: For the love of kelp, Thomas battle gales and snow on a winter expedition to icy northern Norway. The expedition was part of the KELPEX project aimed at determining the importance of kelp export and detritus in Arctic fjord ecosystems. Read more about the KELPEX project and expeditions on the blog maintained by project postdoc Dr. Karen Filbee-Dexter. 17 January 2017 Media: On kelp, mangroves, peat and coral – Four environmental tragedies in 2016. The ‘Protect the Bush Alliance’ writes about some of the biggest environmental tragedies of 2016. Sadly, the loss of kelp forests in WA was one of them. 12 January 2017 Communication: Thomas delivers the congress keynote at the 30th Congress of the Phycological Society of Southern Africa, De Hoop (South Africa). 20 December 2016 Media: Some kelp forests show surprising resistance to climate change – but it’s not all good news. Thomas talks to Oceana about kelp forests. 15 November 2016 Media: Tropical invaders, heat waves and pollution take toll on Australia’s kelp forests. Thomas talks to ABC Science News about kelp loss and our new PNAS paper. 15 November 2016 Communication: Underwater health check shows kelp forests are declining around the world – article on The Conversation discussing the main findings of two PNAS papers. 15 November 2016 Publication: New paper in PNAS sporting a global analysis of kelp forest trajectories showing 38% of kelp forests have declined, 35% remained unchanged and 27% have increased over the past half century. The study was conceived during meeting in Santa Barbara as part of an NCEAS working group. Read the UWA media release here. 2 November 2016 Funding success: Congratulations to Yannick who won a grant from The Holsworth Wildlife Research Endowment for the project ‘Functional redundancy of seaweed canopies‘ as part of his PhD research. 1 November 2016 Funding success: The outcome of ARC Discovery Projects has been announced and our project Global threats to ocean forests: understanding impacts of heatwaves, herbivores and diseases in kelp ecosystems was supported! Super excited to be working with Adriana Vergés and Peter Steinberg (UNSW) on this awesome project! 14 October 2016 Media: Ocean heatwave destroys Tasmania’s unique underwater jungle. Giant kelp forests in Tasmania lost to the 2016 marine heatwave. Thomas talks to Karl Mathiesen (Climate Home). 18 September 2016 Media: Kelp, mangroves fall victim to ocean warming. The west coast kelp loss featured in Frontiers in Ecology and Environment, where Thomas talked to Claire Miller [pdf]. 15 August 2016 Media: Thomas and colleagues talk to The Guardian about marine heatwaves in the article “‘The blob’: how marine heatwaves are causing unprecedented climate chaos“. 11 August 2016 Feature: Thomas featured in the UWA Alumni connect newsletter. Read the story here. 8 July 2016 Communication: Video where Scott and Thomas explain the impacts of the 2011 marine heatwave on WA’s kelp forests. 8 July 2016 Publication: Our new paper in Science documenting the long-term impacts of the 2011 marine heatwave on WA’s kelp forests. This important paper would not have been possible without the collaboration of researchers from a broad range of institutions including AIMS, CSIRO, DPaW, WAM, Curtin, ANU and several international partners. Read the UWA news here. 5 June 2016 Achievement (?! ): Team kelp dominated the Marine Ecology Group paint ball shoot-out, exterminating team seagrass (3:1 wins). 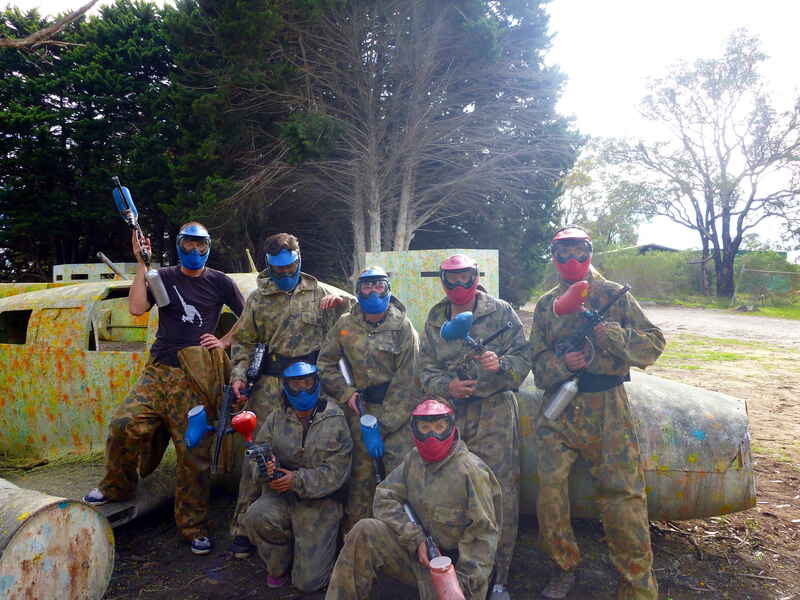 An amazing day out – sun, sweat and swat: nothing like a bit of combat to rally the troops for the battle of science. Go kelp go! 18 May 2016 Publication: A new paper we have contributed to on the phylogeny of the Gelidiales rename Pterocladia rectangularis, a beautiful little red seaweed from Hamelin Bay. It is now Orthogonacladia rectangularis (Lucas) G.H. Boo & T. Wernberg comb. 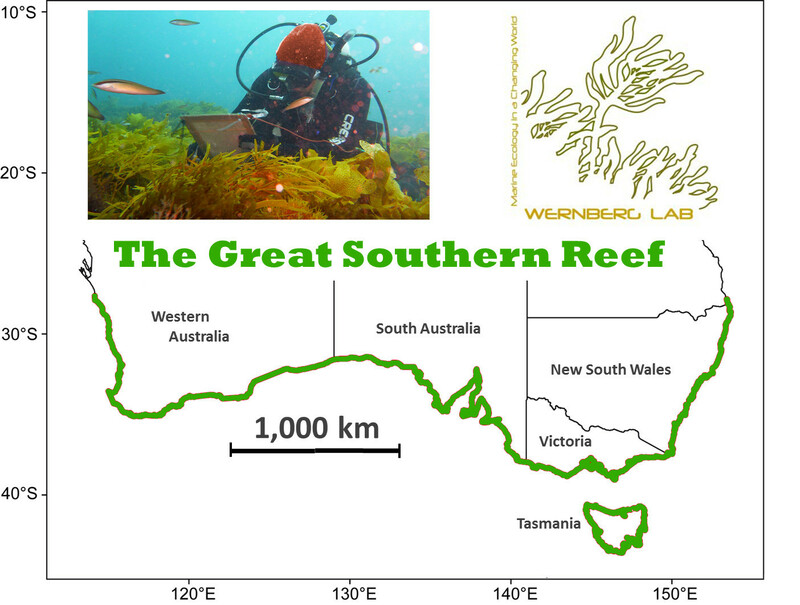 nov.
16 January 2016 Communication: Launch of video on Australia’s Great Southern Reef (watch the video on youtube) where Scott and Thomas talk about the magnificence and contribution of Australia’s neglected kelp forests (read the UWA media release). 12 January 2016 Achievement: Our paper on species traits, climate velocity and range shifts announced one of the most talked about papers in Ecology Letters in 2015 – go Jenn Sunday! 22 December 2015 Press release: Marine forests highly specialised and sensitive to warming (read the statement here) following the publication of our new paper in Nature Communications on adaptation, heatwaves and thermal safety margins. 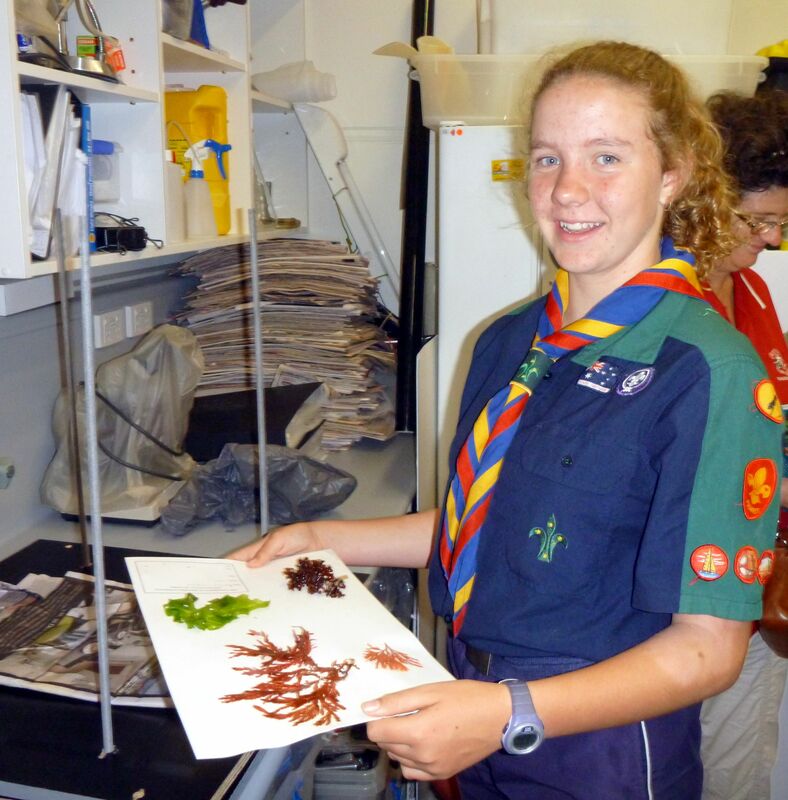 10 November 2015 Outreach: Visit from Warwick Scouts for an interesting night of talk about science, seaweeds, kelp forests and the Great Southern Reef. 10 November 2015 Achievement: Congratulations to Chenae on winning a Field Work and Data Collection award from the UWA Postgraduate Students Association! 30 October 2015 Funding success: ARC Discovery Projects have been announced and Thomas and Melinda Coleman’s project Genes to ecosystems: drivers of resilience in underwater marine forests was successful. Yay! October 2015 Publication: Marine ecology virtual issue in the Journal of Ecology features Scott and Thomas’ paper on recruitment facilitation in WA seaweed forests. 1 October 2015 Media: Is it time for the Great Southern Reef? Article in the Australian Geographic highlighting the GSR! 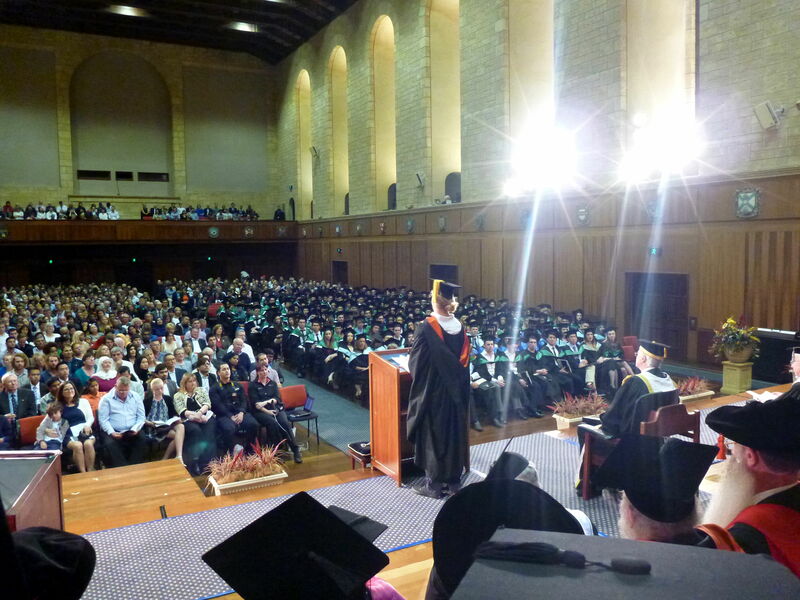 17 September 2015 Achievement: Congratulations to Dr Scott Bennett on graduating and being invited to deliver the valedictory! And good on him for getting a plug to the GSR in there! 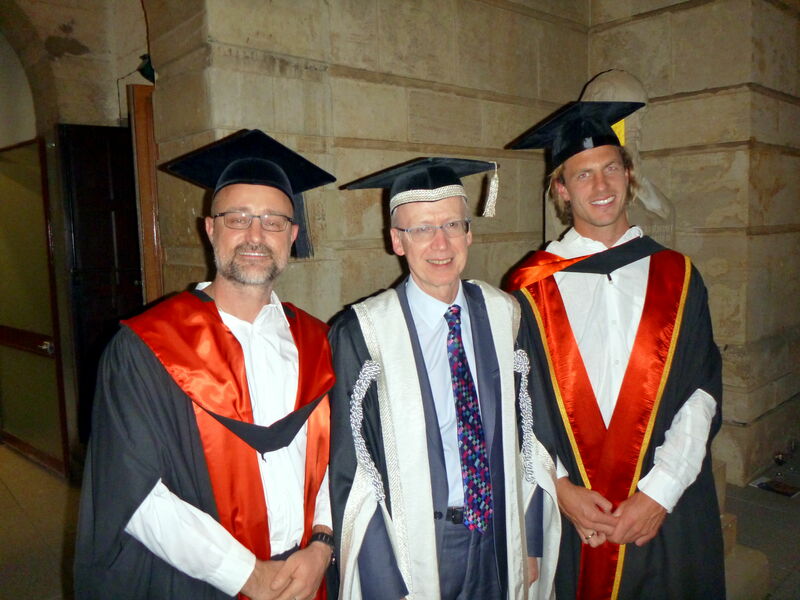 Right, Scott and Thomas with Professor Paul Johnson, Vice-Chancellor for UWA. 3 September 2015 Communication: A little squirt with a potentially large and damaging environmental punch. Article in the Oceans Institute newsletter where Tiffany explains the findings of one of her studies – the colonial ascidian Didemnum perlucidum has invaded the Swan River estuary and is now over-growing seagrasses. Also published on ScienceNetwork WA. [pdf]. 19 August 2015 Communication: Our very own movie-star! Chenae promoting postgraduate studies in Marine Systems in the School of Plant Biology on you-tube with Matt Fraser. 18 August 2015 Achievement: Huge congratulations to our Danish interns, Pernille and Maj-Britt, who finished their degrees as lab technicians from Copenhagen Business Academy – both with excellent marks! Pernille (right) scored the highest mark possible for her report on ‘Seasonal variation in biochemical composition of Ecklonia radiata‘. Wohoo! 18 August 2015 Media: Cover story in the Walpole Weekly: Our $10 billion “Great Southern Reef”. 17 August 2015 Communication: “Australia’s ‘other’ reef worth more than A$10 billion per year – have you heard of it?“. Article (‘editors pick’!) on The Conversation by Thomas, Scott and collaborators, outlining the value of The Great Southern Reef and Australia’s kelp forests [pdf]. See also our new, underlying paper published in Marine and Freshwater Research or read the press release. 24 July 2015 Achievement or communication? WernbergLab 4-ever! 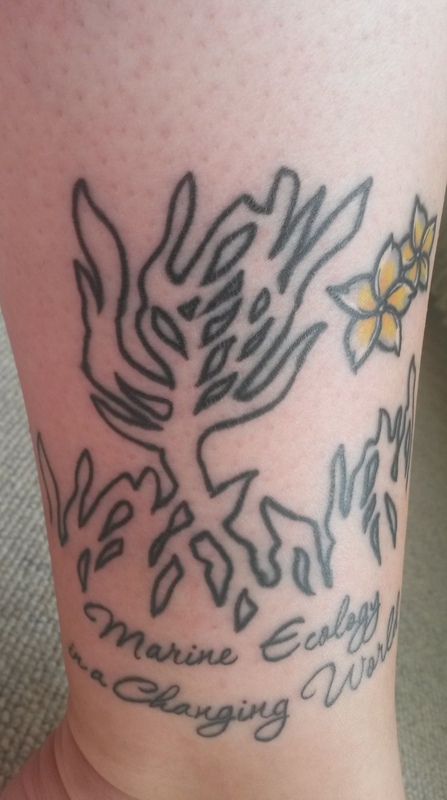 Maj-Britt sets a new standard for students and interns with a tattoo of our logo to commemorate her 10-month internship. She also confesses to being ‘damaged’ by her stay here – apparently she now regularly collects seaweed on the beach and press them at home! 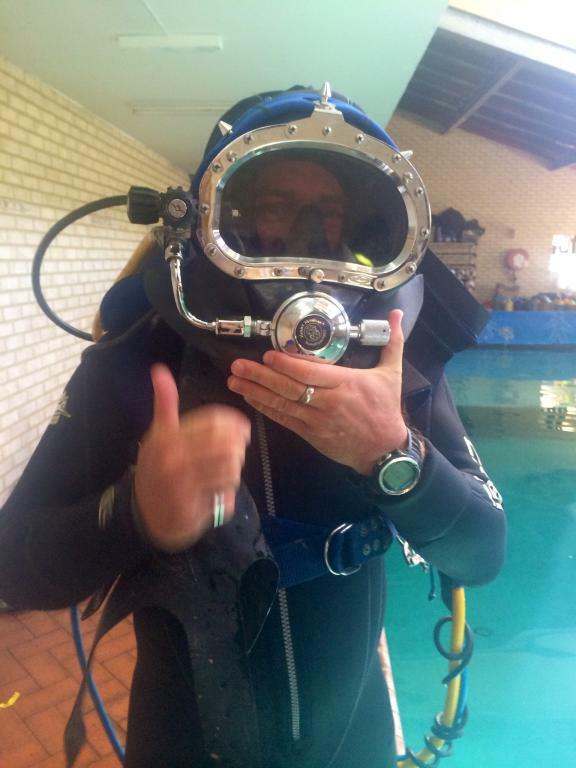 9 June 2015 Announcement: Thomas joins the UWA Oceans Institute leadership team. 8 June 2015 Media: Scott talks to ABC News about our paper in Ecology Letters and Tropical fish usually found at Ningaloo Reef move south to feed on kelp forests. Interview and footage of fish feeding on transplanted kelps! 5 June 2015 Press release: Kelp forests impacted when underwater worlds collide following the publication of our ‘Tropical herbivores provide resilience to a climate-mediated phase shift on temperate reefs‘ paper in Ecology Letters. In the paper we show how tropical herbivorous fishes now prevent recovery of kelp forests lost during the 2011 marine heatwave. [pdf]. 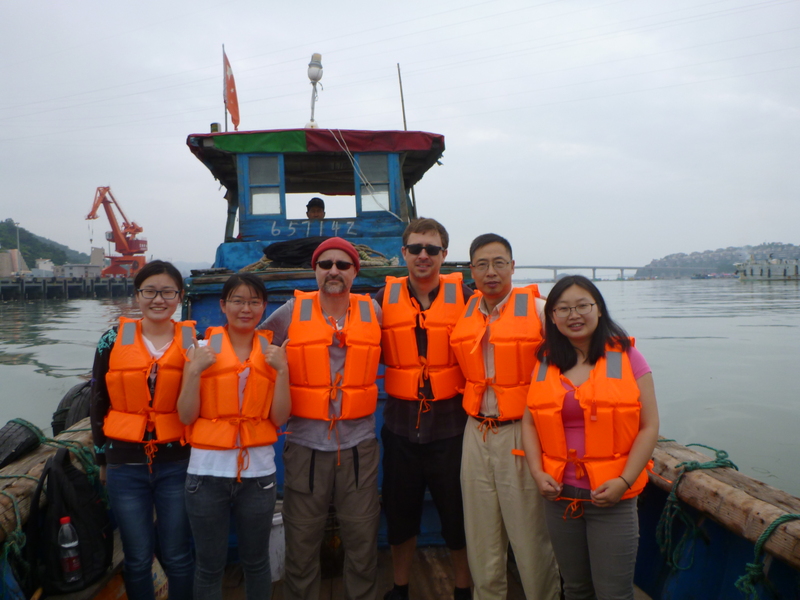 1 June 2015 Collaboration: Thibaut and Thomas visits Dr Xiao and Prof Wu in China for seaweed sampling and discussions about using seaweed farms for bioremediation. 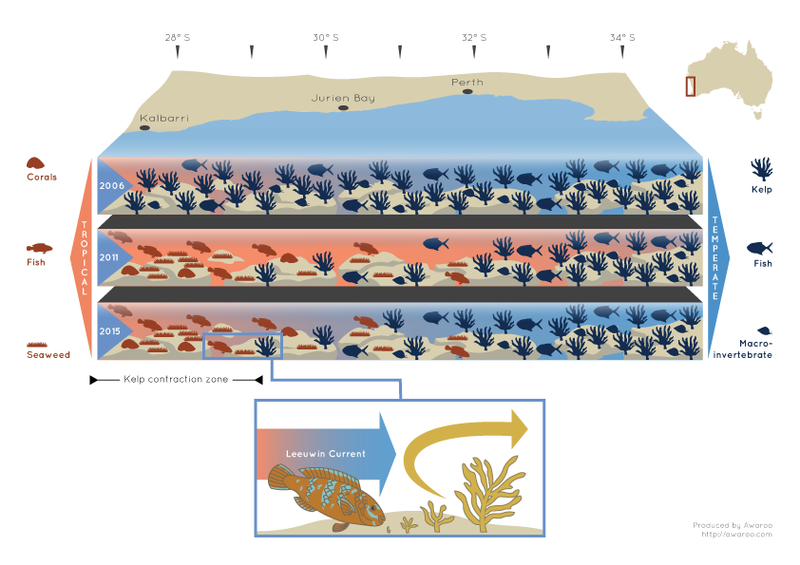 26 May 2015 Achievement: Our recent paper on the tropicalisation of temperate marine ecosystems worldwide, published in the Proceedings of the Royal Society B and led by Adriana Vergés, has been recommended by F1000Prime as being of special significance in its field by F1000 Faculty Member Kevin Lafferty. [pdf of F1000 recommendation]. 15 May 2015 Communication: Article on Science Network WA ‘Kelps that grow together, stay together‘. 14 May 2015 Press release: ‘Kelps work together to survive in a stressful world‘ following the publication of our ‘Canopy interactions and physical stress gradients in subtidal communities‘ paper in Ecology Letters. The paper details work undertaken by Scott, Thomas and Thibaut on three continents, showing how common positive interactions are in subtidal canopy environments. [pdf]. 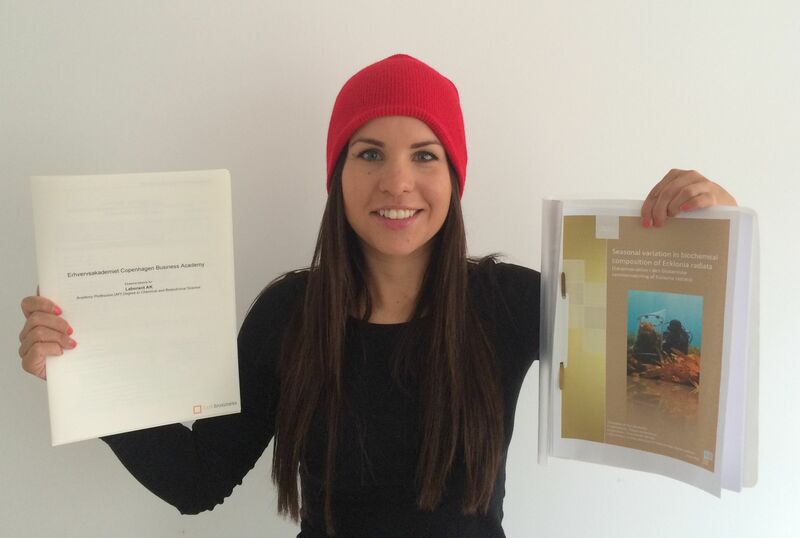 22 April 2015 Achievement: Mariah wins third place at the AMSA WA Honours student prize night for her presentation “Growth and population dynamics of the coral Plesiastrea versipora along a temperature gradient”. Awesome achievement Mariah! 6 February 2015 Communication: “Marine heatwaves threaten the future of underwater forests“: article on The Conversation, by Thomas and Dan, highlighting the threats to temperate marine ecosystems as climate variation is set to increase in intensity and double in frequency. Read the article here. Published again 13 February on ScienceNetwork WA (click here). [pdf]. 20 January 2015 Announcement: Thomas joins the editorial team of Aquatic Botany as co-editor-in-chief. Read the announcement from Elsevier online or pdf. 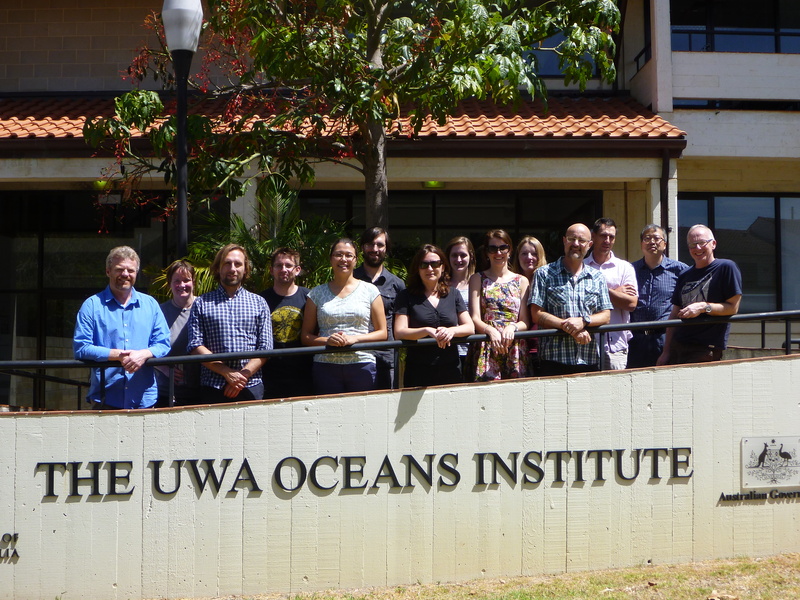 19-21 January 2015 Collaboration: Thomas, Dan (MBA), Neil (UTAS) and Eric (UTAS) hosted international working group on ‘Marine Heat Waves: Physical Drivers and Properties‘ at the UWA Oceans Institute. The workshop brought together physical oceanographers, atmospheric climate scientists and marine ecologists for three extremely productive days of discussions on what marine heat waves are. 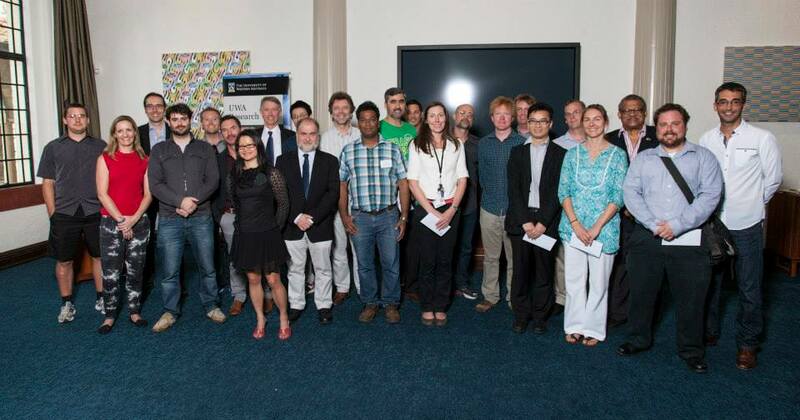 6 November 2014 Achievement: Thomas was awarded a UWA Research Excellence and Innovation Award. The awards recognise outstanding contributions of UWA researchers in each of the fields of Science and Medicine; Mathematics, Computer Science and Engineering; Business and Law; Arts and Humanities; and the Social Science. More than 100 high-performing academics were nominated for these prestigious awards. 5 November 2014 Media: Thibaut starring in the program ‘des racines et des ailes‘ on national television in France, with live images from Morlaix during our recent field trip to Europe and talk about our inter-continental research on kelps and climate change. Watch the u-tube clip here (fast-forward to 6:00) or read about the trip here. 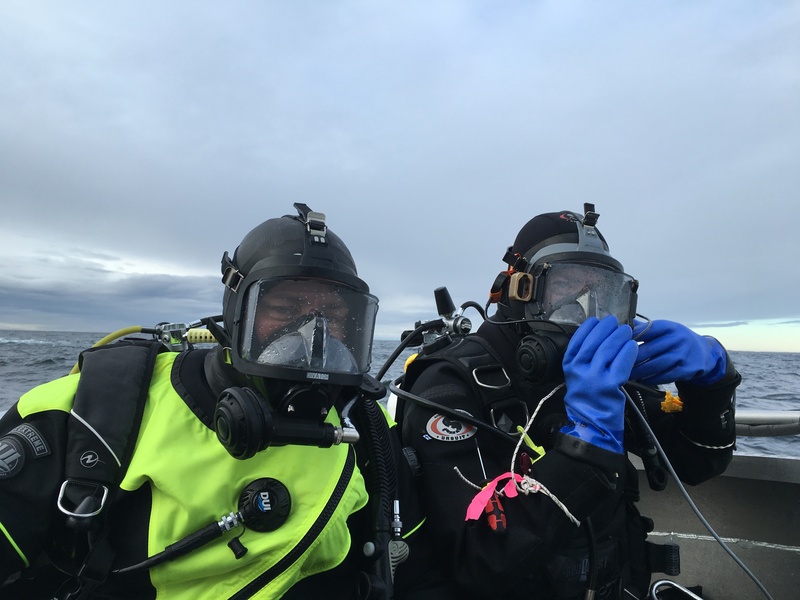 1 October 2014 Achievement: Thibaut and Thomas were among the first six divers to complete the Marine Research Diver SSBA Scientific Diver Training in Australia. The qualification developed by Orca Training is designed to meet the Australian Standard 2299.2 as an occupational diver for scientific diving. Read the announcement in the UWA Safety & Health newsletter here. 22 September 2014 Media: Full page article in the Oceans Institute newsletter about Thibaut and Thomas’s recent trip to Europe for collaborations on kelps and climate change in the LINK project. Read the article here. 22 September 2014 Media: News box in the Oceans Institute newsletter about Xiao Xi’s visit and collaboration with Thomas and Thibaut on seaweed experiments. Read the article here. 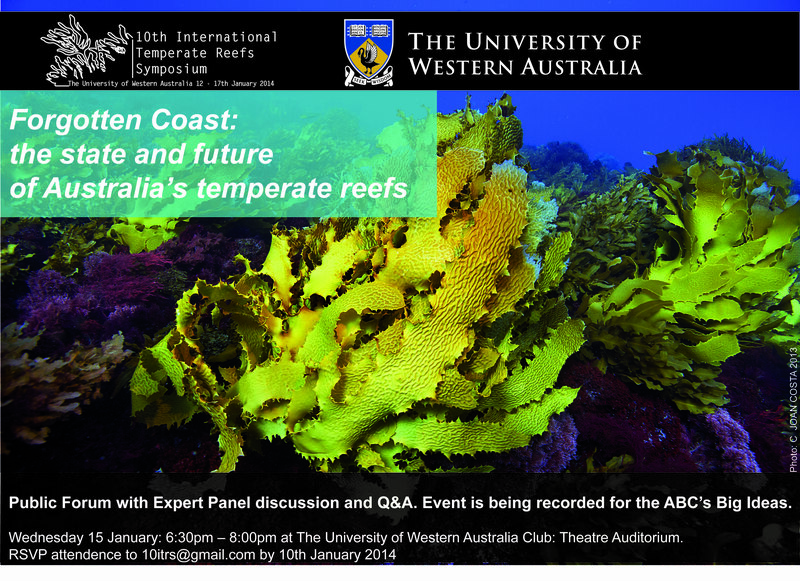 16 September 2014 Media: Tropicalisation of Sydney’s temperate reefs. Our heat wave research featured in an article on The Conversation by Adriana Vergés. Read Adriana’s article here. 28 August 2014 Communication: Scott discusses the need for focus and funding, for WA’s temperate reefs, in a perspective piece entitled “Can’t see the kelp forest for the…corals? Time to value our temperate reefs“, published on Science Network WA. Read the online version here or download a pdf here. 29 July 2014 Article on Science Network WA highlighting the global threats to temperate reefs from tropicalisation, with mention of or work and impacts in WA. July 2014 Our recent paper on the tropicalisation of temperate marine ecosystems worldwide [pdf, pdf SOM], published in the Proceedings of the Royal Society B and led by Adriana Vergés, featured in National Geographic, ABC Science, and Sydney Morning Herald. 2 April 2014 The Proceedings of the Royal Society B has just announced, that our paper on the range contraction of Scytothalia dorycarpa during the 2011 marine heat wave [pdf], was in the top-10 of their most cited 2013 articles. See the list online here or download it as a pdf here. 20 March 2014 Port Safe & Sound! Tiff does it again – news story in the Albany Advertiser about her sampling of invasive ascidians in King George’s Sound [pdf]. 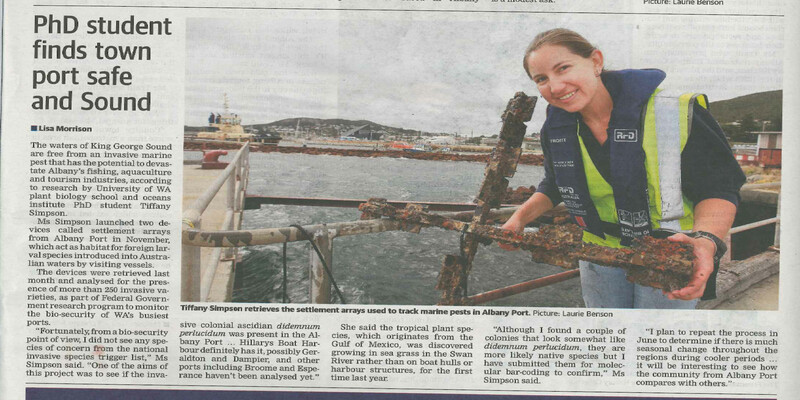 21 November 2013 News story in the Albany Advertiser about Tiff‘s sampling of invasive ascidians in King George’s Sound. Go Tiffany! [pdf]. 29 August 2013 News story in COHESION Magazine, where Thibaut is interviewed about the 2011 heat wave and our paper in Nature Climate Change. Read the article online here or download a pdf here. 24 August 2013 News story on ScienceNetwork WA about Margie’s PLoS One paper where she documented temporal shifts in gametophyte competency for growth and survival. Read the article online here or download a pdf here. 22 August 2013 Our 2011-review ‘Impacts of climate change in a global hotspot for temperate marine biodiversity and ocean warming’ announced most downloaded paper from JEMBE in the first half of 2013 [pdf]. 13 May 2013 ‘Marine life takes new direction in warm seas’; mention of our Nature Climate Change paper in the West Australia newspaper [pdf]. 20 March 2013 Stefan Andrews has been singled out as a future leader in the underwater environment, as the 2013 Our World-Underwater Australasian Rolex Scholar – a very competitive and prestigious scholarship that will lead on to great adventures and opportunities. Great achievement Stefan! Read the media release here and follow Stefan’s video blog and adventure here. 2 February 2013 ‘Ocean heat hits weed’. Small article on our heat wave research and the disappearance of Scytothalia from Jurien Bay. Subiaco Post (Perth newspaper) [pdf]. 1 February 2013 ‘Ocean heatwave hits WA waters bringing new fish and killing seaweed’. News flash in Australian Maritime Digest (National) about heat wave research at UWA [pdf]. 31 January 2013 ‘Heatwave decimates marine species seaweed habitat’. Small article on our heat wave research and the disappearance of Scytothalia from Jurien Bay. Central Midlands and Coastal Advocate (WA newspaper). [pdf]. 24 January 2013 ‘Mornings with John Cecil’. Interview with Thomas on radio ABC South Coast WA, talking about seaweeds, heat waves range shifting species and climate change. 23 January 2013 ‘PB research hits bottom: ecology of kelps in South Africa’. Full-page story about our trip to South Africa, in the School of Plant Biology Research Newsletter [pdf]. 18 January 2013 ‘Temperature cuts swathe through Australian seaweed’. Blog post on Simple Climate on our Scytothalia paper (see below). 17 January 2013 Article in Die Zeit (German newspaper) about our paper on the disappearing Scytothalia [pdf]. 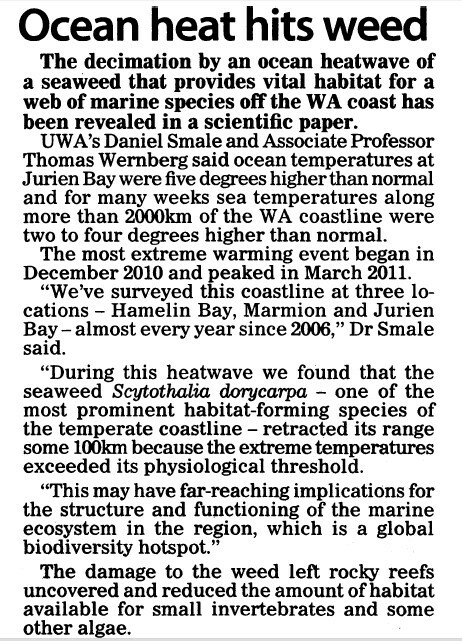 17 January 2013 ‘Hot water peril for marine life’ – article in the West Australian newspaper about our paper on the disappearing Scytothalia [pdf]. 16 January 2013 Article on ABC Science about our new paper in the Proceedings of the Royal Society B, where we document the sudden range contraction of Scytothalia during the 2011-marine heat wave [pdf]. 4 January 2013 Our Nature Climate Change paper on the 2011 marine heat wave highlighted in the 2011-2012 annual report from the Australian Research Council as an outcome under National Research Priority 1 – An Environmentally Sustainable Australia [pdf]. 7 December 2012 ABC news, interview with Thomas, with an update on impacts of the 2011 marine heat wave in Jurien Bay [pdf]. 30 September 2012 Interview with Dan Smale on Science Network WA about our recent paper in MEPS, using the novel hot-plate system to test effects on in situ warming on the development of fouling communities [pdf]. 28 July 2012 Media: Article in the New Scientist [pdf]. Dan Smale is interviewed about our marine heat wave paper which appeared in Nature Climate Change. 23 July 2012 Media: Article on ABC Science [pdf] where Tim Langlois is interviewed about our marine heat wave paper, published in Nature Climate Change. 22 July 2012 Media: Daily News, New Scientist makes a mention of our paper on the marine heatwave. 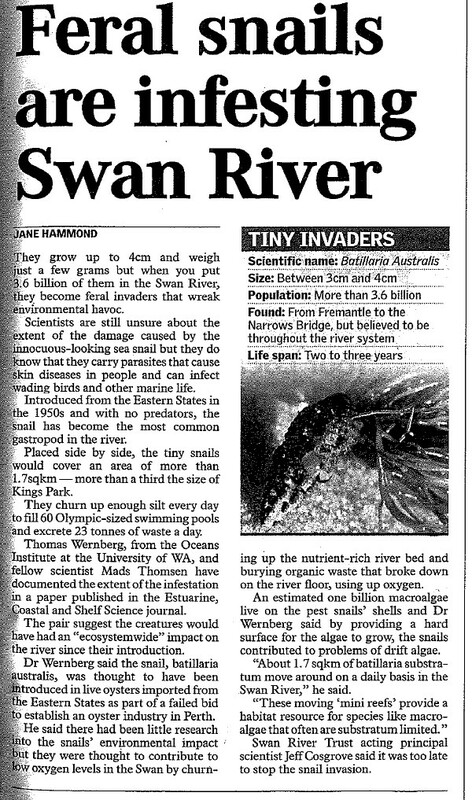 4 April 2012 ‘Algae growth double-edged sword for Swan River biome’ [pdf]. Article on Science Network WA where Mads Thomsen is interviewed about our Harmful Algae paper. 20 March 2012 Press release: Seaweed – a vital resource! University News release on Thomas’ ARC Future Fellowship. 28 November 2011 Our Current Biology paper on seaweeds retreating polewards from warming waters is featured in a Research Highlight in Nature Climate Change [pdf]. 4 November 2011 Thomas speaks to Radio Australia about seaweeds and climate change. 28 October 2011 ‘Seaweeds migrates south with warming seas‘. Our recent research on a poleward shift in the temperate seaweed flora of Australia featured in Australian Geographic. 9 February 2011 Press release: Funding for international collaboration on kelp research. Thomas receives funding from the Worldwide Universities Network to lead a collaborative project on kelp ecology and ecophysiology in a time of climate change. 7 February 2011 Article on Science Network WA where Dan Smale is interviewed on our PLoS One paper on the new technique, ‘hotplates’, for experimentally manipulating temperatures in situ for settling fouling organisms [pdf]. 4 February 2011 Article on ABC News [pdf] where Dan Smale is interviewed about our PLoS One paper [pdf] on the new ‘hotplates’ technique for experimentally manipulating temperatures in situ for fouling organisms. 20 August 2010 Today-tonight (channel 7), tv prime-time feature with Thomas on invasive snails in the Swan River.